A wooden ship rocking slowly under your feet. Through the mist you start to see shapes. 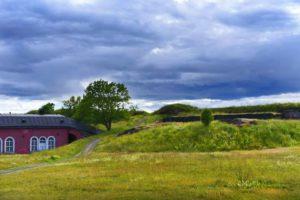 A stone wall of Suomenlinna fortress is coming your way with cannons pointing out. Quick! Turn right! The ship turns slowly, unnervingly, but just in time and into narrow strait. The bottom left side of the hull scraping stones. The noise gives goosebumps, but the massive, journey ending thud never comes. Sailing on through you see rocky walls of a strait on both sides. The massive centuries-old fort passes by on the left. What a perfect place to sink an enemy ship! Welcome to Helsinki. 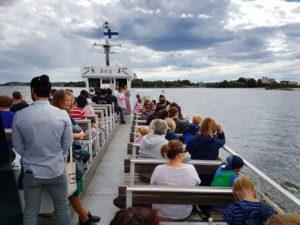 Sailing to Helsinki from the south, Suomenlinna Fortress Island will be on your way. The narrow Kuninkaanmiekka strait is the major shipway and the ferries to Stockholm and Tallinn are navigating daily through it. Whether you are on the ship or on the island – seeing a massive vessel cross this strait is exciting to watch. Being the only Unesco word heritage site in Helsinki, it is also the most visited sight. One million visitors roam the island(s) all year round. It’s not only for tourists but also locals love spending the sunny summer days and having picnics and relaxing on the island. The small beach in a cove can offer you a respite during the hottest summer days. 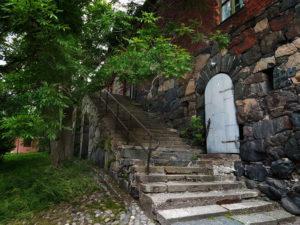 The main gate of Suomenlinna is actually and old barracks building from the Russian times. “Rantakasarmi” was built in 1870. 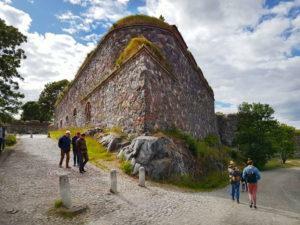 You can find scenic fortress walls all around Suomenlinna islands. Suomenlinna consists of 8 islands most of which are connected by bridges. The islands have permanent residents and therefore ferry traffic to the mainland is frequent and part of the public transportation of Helsinki. The residents have all the basic services including a grocery shop, kindergarten and a primary school, library and plenty of restaurants and cafes. The church of the island is one of the most popular churches for summer weddings. It also doubles as a lighthouse. 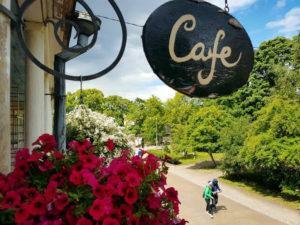 Cafe Vanille is the second cafe from the Suomenlinna harbor. The islands have plenty of workspaces for artists and a recording studio because it is an inspiring place and very quiet since there are no cars. Only the wind, sun and the sea whisper to you. Can you hear what is that they are saying? You can find a lot of handcrafted goods and art and design objects on the boutiques on the island. You can also see plays in a very popular theatre which runs plays during summer months. 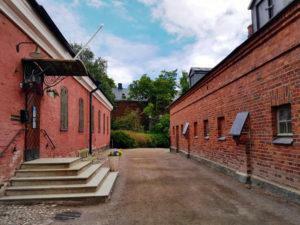 In 2018, the summer theater of Suomenlinna was performing “One flew over the Cuckoo’s nest”. Probably the oldest business on the islands is brewing. The islands don’t have a natural source of fresh water. For centuries the water was brought from neighbouring Vallisaari island and brewed into beer for longer shelf life as the quality of the water wasn’t always guaranteed. By drinking beer, the soldiers got also some of the needed calories for the construction work of the fort. Forms of the defensive bastillions from the air. 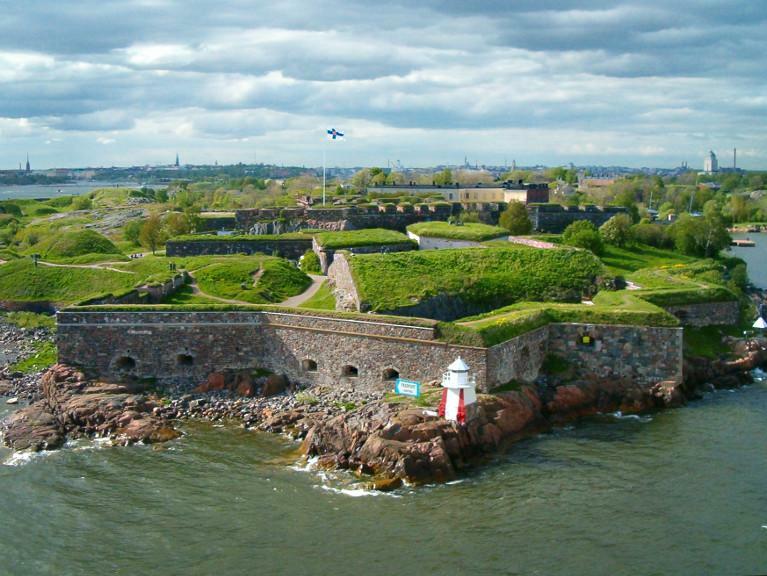 The Suomenlinna fortress was started in preparation for future hostilities with the Russian Empire during 1700s. 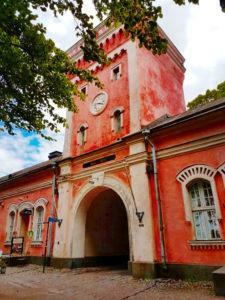 Back then Finland was part of Swedish Empire and the Swedes were getting nervous about the rise of their eastern rival and Suomenlinna island, or rather the group of islands, was chosen for as the place for the major sea fort on the Finnish Bay of Baltic sea. 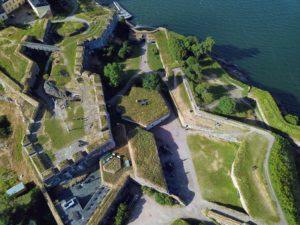 The original Swedish name of the fort is Sveaborg which means literally the castle of Sweden. 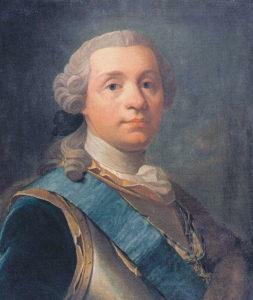 Swedish Count Augustin Ehrensvärd (1710 – 1772) was quite the renaissance man. He was a highly trained military officer, artist, military architect of the fortress and the first commander of the Swedish archipelago fleet. He was known to be both a well seasoned military commander as well as a gifted painter with great sensitivity and style. On the island you can find a bronze monument dedicated for August Ehrensvärld. It is situated in the middle of the main island next to the museum bearing his name too. 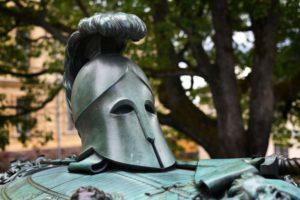 As a classical military symbol from ancient Greek, his monument portrays the helmet of Achilles, the legend of all warriors. 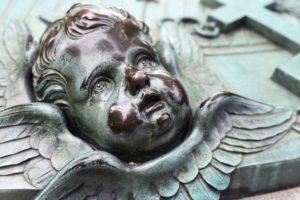 On the monument you can see a small angel, which is considered to bring good luck. Rub it slightly and make a wish. If you believe in it, your wish may come true. 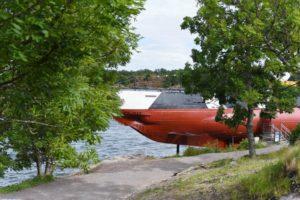 What makes Suomenlinna so special? There are very few places in the world with such unique combination of features as Suomenlinna. Fascinating history Especially on a guided tour or visiting the museum, you will get a sense of how many prominent events related to the history of Finland have happened on these islands. 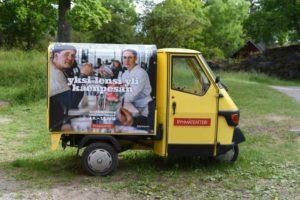 Finnish cuisine – The islands have plenty of restaurants and cafes, hence you don’t need to roam around hungry or thirsty. Even locally brewed beer is available. Meet the locals – You can strike up a conversation with a local when coming out of the library or just by going to the grocery shop. Suomenlinna is also a popular place among Finns living on the mainland. We all love Suomenlinna. The views – Both from the ferry and the islands the refreshing seabreeze will fill you with a calm energy while you are enjoying the views. It’s easy. Ferries leave from the Market Square and they go often until 2 AM. Ferry traffic is part of the public transportation system so with a daily transit pass it will cost you no extra. 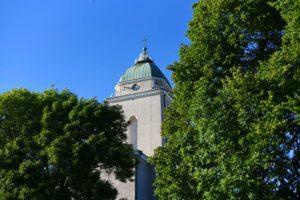 It is Unesco World Heritage site – The only one in Helsinki region. You can go into WWII submarine – Yes, Finnish submarine Vesikko is open for visitors. Can you see the submarine hiding behind the trees? Run free! The islands are big and spacious.